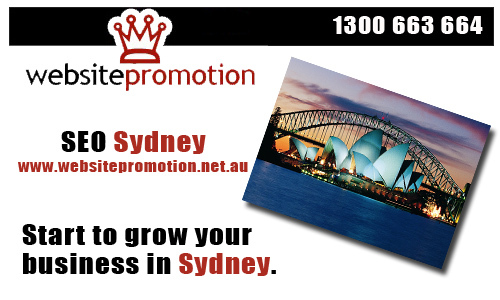 Sydney’s booming economy has brought SEO Sydney to top businesses seeking for quality Search Engine Optimisation firms. SEO Sydney by Website Promotion has been in operation for over 13 years providing leading-edge SEO techniques and Search Engine Marketing. Results are guaranteed with the expertise of their in-house SEO Specialist and SEO-oriented web designers and developers. Website Promotion only uses white hat SEO where you can assure that your site is search engine-friendly, crawable and indexable. If you are looking for affordable SEO Sydney, Website Promotions offers a wide range of SEO Packages to start your business grow and dominate the Search Engines. Search Engine Optimisation provides opportunity for your business to get higher visibility online, drive traffic and gain lots of customers.